Context: Limb lengthening correction according to Ilizarov distraction osteogenesis (DO) usually yields excellent results. While pediatric orthopedic surgeons anecdotally report that botulinum toxin A (Botox) alleviates spasm and pain during DO, no study has examined the effects of this surgery and Botox injection on muscle morphology in children. Aims: (1) To evaluate the clinical and radiological effects of lower limb lengthening in children and (2) the effects of adjunctive Botox muscle injection. Setting and Design: This was a center and randomized control trial. Methods: Seven children underwent tibial (n = 3) or femoral lengthening (n = 4) and were randomized to receive either a Botox or sterile saline solution. Quality of life and functional mobility outcomes, muscle testing, and magnetic resonance imaging examination were obtained at baseline, 12-, and 24-month postoperative. Muscle measurements were acquired on axial T1-weighted images and included: (1) total cross-sectional area (TCSA), (2) functional cross-sectional area (FCSA, fat-free area), (3) ratio of FCSA to TCSA, and (4) asymmetry between sides. Results: Physical performance improved at 12- and 24-month postoperative. Muscle strength remained functional across the three time points. A decrease in TCSA and FCSA was observed at 12-month follow-up in the operated thigh of patients undergoing femur lengthening, but muscle mass was regained at 24 months. However, TCSA and FCSA remained lower in the operated femur at 24 months. Similar findings were also observed in patients who underwent tibial lengthening. Patients in the Botox group appeared to have a slightly greater decrease in muscle mass and increase in fatty infiltration in the operated leg. Conclusions: Children undergoing DO preserved their muscle strength and improved physical performance 2-year postoperative. Our results suggest that muscle size and muscle mass remained lower in the operated leg; a finding that was slightly more prominent in children who received a Botox injection. Limb lengthening and deformity correction according to Ilizarov distraction osteogenesis (DO) principles yield excellent results in most cases;,,,, however, several challenges are inherent to this technique., Postoperative pain can be significant and often requires prolonged use of analgesics and even narcotics. The increasing soft-tissue tension, pin site infections, and intensive range of motion exercises also contribute to discomfort and pain during the lengthy distraction process. Pain may directly lead to a decrease in joint range and weight bearing, thus potentially interfering with regenerate bone formation. The lengthening procedure in itself may cause functional and clinical muscular changes, due to disuse of the affected lower extremity and overuse of the contralateral side. Botulinum toxin A or onabotulinum toxin A (Botox, Allergan Inc., United States) is known to possess both analgesic and paralytic actions by producing temporary muscular relaxation through the blocking of acetylcholine release. Clinical observations suggest that Botox has an antinociceptive action independent of its paralytic effect and positive outcomes including improved gait pattern, and physical function in children with a variety of musculoskeletal conditions. Hence, the effect of Botox may be ideal in the context of limb lengthening and deformity correction, especially as when muscle power returns to normal, pain relief may subsist., However, radiological and clinical evidence regarding the return of muscle function in children following Botox injection is lacking. The effects of paralysis or paresis on muscle mechanics remain limited in animal and human models.,, Pediatric orthopedic surgeons specializing in limb lengthening and reconstruction have reported anecdotally that Botox alleviates spasm and pain during DO. Results from a randomized controlled trial (RCT) on 125 children support this hypothesis as lower pain levels at day 1 following surgery were reported in the Botox group compared to the placebo group. Another study found no difference in pain or range of motion between the leg injected with Botox and the leg injected with a saline solution in 36 patients undergoing bilateral tibial lengthening. However, we are not aware of any study that examined the long-term impact of DO on muscle with or without adjunctive Botox injection in children. Therefore, the aims of this study were to evaluate: (1) the radiological and clinical effects of lower limb lengthening on muscle, and (2) the effects of adjunctive Botox injections in muscles of children undergoing femoral or tibial lengthening 2-year postsurgery. It is hypothesized that the lengthening procedure in itself may cause clinical and radiological muscular changes, due to disuse of the affected lower extremity and overuse of the contralateral side. Furthermore, we hypothesize that, in muscles injected with Botox, muscle strength levels will be reduced following Botox injection, but will eventually return to baseline levels. This pilot study was part of a multicenter, double-blind RCT that evaluated the effect of Botox on postoperative pain, functional outcomes and quality of life.,, The design used for the substudy, which was conducted at 1 site only, was prospective with three time points: baseline (Time 1), 12 months (Time 2), and 24 months after surgery (Time 3). Ethical approval was obtained from the local institutional review board before the commencement of the study. All participants provided signed informed consent. Initially, a separate randomization plan was provided for the participants enrolled in the main study who agreed to be part of this radiological substudy. Once the main study completed its enrolment, the randomization was replaced with preference design and eligible candidates for the radiological substudy were then allowed to opt-out of the randomization. The surgeon, participant, and the consultant interpreting the magnetic resonance imagings (MRIs) were blinded to treatment allocation. Children between 8 and 21 years of age who underwent a unilateral femoral or tibial lengthening at Shriners Hospitals for Children-Canada were invited to participate. Children who could not undergo MRI without sedation or who had a contraindication to MRI (e.g., metal clips or wires) were excluded. Potential participants from the previously described RCT were screened for eligibility by the project coordinator, who then obtained appropriate consents. An appointment for the baseline MRI was scheduled at the local children's hospital. Baseline testing also included a clinic visit with the pediatric orthopedic surgeon, manual muscle testing (MMT), and range of motion evaluations by a physiotherapist and completion of the pediatric outcomes data collection instrument (PODCI). These measures were repeated at 1- and 2-years following surgery. MRI was performed on 1.5 Tesla magnet (GE Signa) with no intravenous contrast injection and was obtained at baseline (Time 1), 12 months (Time 2), and 24 months after surgery (Time 3). SET1 − weighted sequences (time repetition [TR] = 300−500 ms and time to echo [TE] = 10 ms) and short tau inversion recovery sequence (TR = 4500−5500 ms, TE = 25−40 ms, inversion time TI = 150 ms) were obtained with 5 mm slice thickness and 1 mm gap, in both axial and coronal planes. The coronal plane was obtained parallel to the imaged dominant long bone (either femur or tibia) and covered the entire width of the segment from anterior to posterior skin. Axial slices were covering proximal and midthigh in patients with a femoral length discrepancy, cranial, and caudal thirds of the leg in patients who had a tibial length discrepancy. MMT was assessed by a physiotherapist using a 5-point numerical scale and was performed bilaterally. The PODCI, developed by a workgroup assembled by the Pediatric Orthopaedic Society of North America, is a questionnaire used to measure functional outcomes in pediatric orthopedics. Six functional dimensions assessed include upper extremity functioning, transfers and basic mobility, sports and physical function, comfort/pain, global function (an average of the four previous scores), and happiness with physical condition. Previous work has shown the PODCI questionnaire to be a valid and reliable instrument for assessing function in pediatric orthopedic populations. Both the self-report and parent-report versions were used. All muscle measurements were acquired on the axial T1-weighted images. Coronal slices were initially used to properly select axial slices, which were then analyzed. To ensure consistency across the three examinations done in each patient, axial levels were selected according to the distance from specific anatomical landmarks, such as the lateral femoral condyle lower edge, lateral tibial plateau lateral corner, top of the greater trochanter, or top of the femoral head. In patients with femoral length discrepancy, the selected slice was at the level of the mid-third of the thigh muscles to ensure the maximum thickness of the quadriceps muscle. For patients with tibial length discrepancy, two levels were chosen, one through the proximal third of the calf muscles and one through the distal third of the calf muscles. MRIs were reviewed for accuracy by an experienced pediatric radiologist (CSM) who numerically coded each selected slice, one per side and per examination of patients with femur involvement, two per side and per examination of patients with tibia length discrepancy. Digital Imaging and Communication in Medicine images were anonymized and given a random number before processing with the quantitative analysis of the muscle morphology. Detail of image selection was filed in an Excel table, only made available to the radiologist involved until final processing of the data was achieved. Quantitative muscle measurements were acquired using ImageJ imaging software (version 1.43, National Institutes of Health, Bethesda, Maryland). The muscle measurements of interest at each time point included the following: (1) total cross-sectional area (TCSA) of the thigh and lower leg musculature [Figure 1] and [Figure 2], (2) functional cross-sectional area (FCSA) representing the total area of pure muscle mass, excluding intramuscular fatty infiltration, (3) ratio of FCSA to TCSA, which was used as an indicator of muscle composition (a lower ratio is indicative of more fatty infiltration), and (4) TCSA and FCSA asymmetry between the operated and nonoperated sides. Any bony area (e.g., femur, tibia, fibula) was excluded from the muscle TCSA measurement. The FCSA was obtained by selecting a threshold signal within the muscle TCSA to include only pixels within the lean muscle tissue range. This technique has been previously shown to be highly reliable to assess lumbar muscle composition. The grayscale range for lean muscle tissue was established for every patient, on each scan slice. The percentage difference (asymmetry) in TCSA and FCSA between the operated and nonoperated leg was calculated using the following formula: ([nonoperated side − operated side]/nonoperated side]) × 100. A single trained reader (MF) performed all muscle segmentations while blinded to the patient clinical information and MRI time point of acquisition. A sample of 10 images was randomly selected to assess the reproducibility of the TCSA and FCSA measurements. Intraclass correlation coefficients for both measurements was 0.99, showing excellent reliability. MMT scores from the operated and nonoperated sides were compared with paired t-tests. A mixed effect model was used to compare the scores of the 6 PODCI domains at the three time points and between the parent and the child. Descriptive statistics (means, standard deviation [SD], and percentage change) were used to assess the progression of muscle changes in the affected and unaffected leg at Time 1, Time 2, and Time 3. Paired t-tests were used to investigate the difference in muscle size and composition measurements between these three time points. 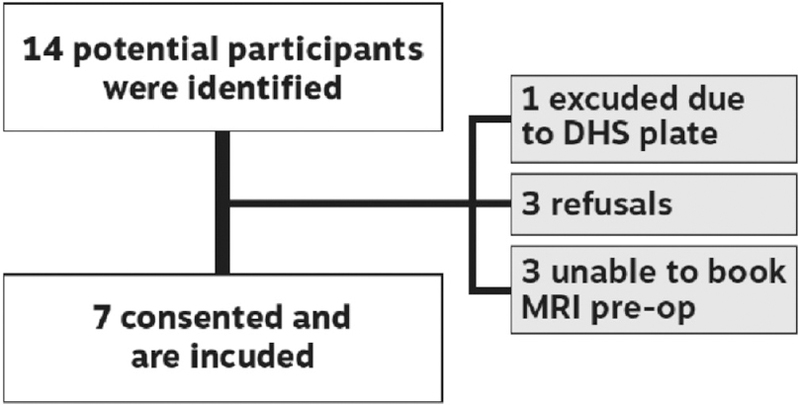 Fourteen patients were screened for eligibility, of which seven were not included for reasons of refusal (n = 3) or inability to undergo MRI presurgery (n = 4) [Figure 3]. No patients were lost to follow-up. Seven patients (5 males, mean age = 15.85 ± 3.61 years) were included in this study [Table 1]. The youngest and oldest patients were 10.4 and 19.6 years of age, respectively. Lengthenings were performed between November 2010 and July 2012. Three of the participants had tibial lengthening's using a circular fixator (fibular hemimelia, n = 2, mean length in fixator = 275 days, Blount's disease, n = 1, length in fixator = 265 days). Four participants had a femoral lengthening. The monolateral fixator was used for two patients who had a congenital short femur and one patient with meningococcemia (mean length in fixator = 222 days); and a circular frame was used for one patient who had a genu valgum deformity due to trauma to the growth plate (time in fixator = 117 days). Mean leg length discrepancy at baseline in the tibia was 5.3 cm and 3.9 cm in the femur with mean lengthening achieved of 5.0 cm for the tibia and 3.8 cm for the femur. Mean follow-up was 25.3 months (SD = 1.4 months), with a range between 23.9 and 28.0 months after the lengthening surgery. The randomization occurred in the first four participants resulting in two participants allocated to Botox (1 femur, 1 tibia) and two allocated to placebo (1 femur, 1 tibia). In the following three participants since randomization was replaced with preference design, all three opted out of the randomization and were therefore combined with the placebo group. All four participants who underwent a femoral lengthening completed MRI testing at all three time points. Only one of the three participants who underwent a tibial lengthening completed all three MRIs, because of scheduling difficulties at time 2. For those undergoing femoral lengthening, the muscle strength at both quadriceps and hamstrings remained functional (≥4.5 out of 5) at all three time points. No effect of Botox on muscle strength was noted in the participant who was randomized to Botox. For those undergoing tibial lengthening, the muscle strength of the tibialis anterior remained functional (≥4 out of 5) at all three time points. The participant who received Botox injection to the gastrocnemius showed a significant decrease in this muscle strength at Time 2; however, he returned to near baseline value at Time 3 (5 and 4.5 out of 5, respectively). The only domain of the PODCI that changed over time was sports and physical function domain. Both parents and children reported less difficulty participating in sports and better performance in physical activities (such as running, bicycling, stair climbing, and walking) from Time 1 to Time 3, as well as from Time 2 to Time 3 (P = 0.029). There were no differences among the scores in any of the PODCI domains from Time 1 to Time 2 nor between parent and child reports. There was no significant difference in TCSA and FCSA between the operated and nonoperated thigh at baseline. Our results showed a decrease in TCSA and FCSA at Time 2 in operated leg [Table 2]. Accordingly, a significant increase in TCSA asymmetry between the operated and nonoperated leg was observed at Time 2. However, the decrease in muscle size (TCSA) and pure muscle mass (FCSA) was regained at Time 3. A decrease in muscle composition (FCSA/TCSA) in the operated leg was also demonstrated denoting an increase in fatty infiltration at Time 2, though muscle composition normalized to the baseline level at Time 3. Conversely, there was an increase in muscle size and mass in the nonoperated leg at Time 2 and Time 3, and muscle composition remained consistent across the three time points. The longitudinal changes of the thigh musculature by treatment group are presented in [Table 3]. The participant who received a Botox injection appeared to have a greater decrease in muscle size (TCSA, −15.3%) and mass (FCSA, −21.3%) in the operated thigh from Time 1 to Time 2 as compared to the participants in the placebo group, 0.54 ± 10.7% and 3.5 ± 13.8%, respectively. However, a decrease in muscle size (−11.2%) and mass (−10.8%) was also observed in the nonoperated thigh of this participant, as opposed to the contralateral leg of the three patients in the placebo group. Accordingly, a greater increase in fatty infiltration was also observed in the patient treated with Botox. At Time 3, although a slight increase in TCSA was observed (3.6%) as compared to baseline, muscle mass was slightly lower (−2.6%) and fatty infiltration (−0.05) slightly higher in the operated thigh of the patient treated with Botox. Patients in the placebo group demonstrated an increase in muscle size (12.5 ± 12.0%) and mass (13.1 ± 14.1%) of the thigh muscles in the operated leg at Time 3, while fatty infiltration remained relatively constant (0.004 ± 0.03). There was no significant difference in muscle size and mass between the operated and nonoperated leg at baseline, though both parameters were smaller in the proximal and distal third of the operated leg [Table 4]. At Time 3, there was an increase in size and mass in the proximal third and distal third of the operated and nonoperated legs. 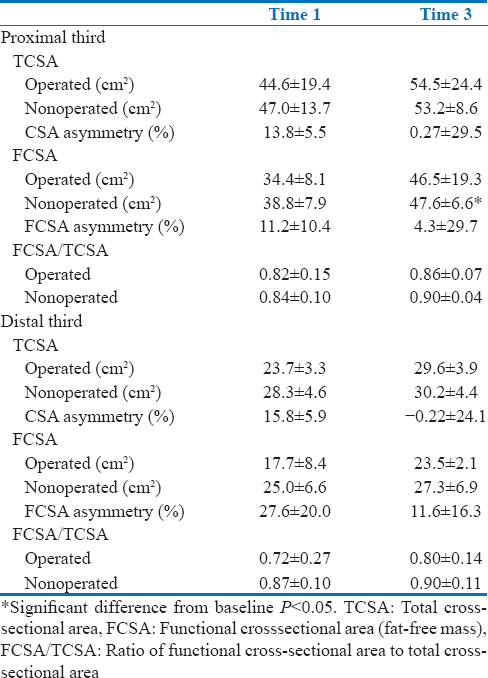 The ratio of FCSA/TCSA at the proximal third and distal third was also smaller in the operated leg at baseline in comparison with the nonoperated leg, suggesting lower muscle quality (more fatty infiltration) in the affected leg before the surgery. Even though an increase in FCSA/TCSA was observed in both legs, FCSA/TCSA remained lower in the operated leg. The longitudinal changes of the lower leg musculature by treatment group are presented in [Table 5]. An increase in muscle size and mass was observed in the proximal third of both legs in the Botox and placebo group at Time 3. Despite an increase in muscle size, an increase in fatty infiltration (−0.12), at this time, was observed in the operated leg of the patient in the Botox group. An increase in the asymmetry between the nonoperated and operated leg at the proximal and distal third of the leg was also present at Time 3 in the patient that received Botox, while both patients in the placebo group showed a decrease in TCSA and FCSA asymmetry. One of the patients in the placebo group had a remarkable increase in muscle size and mass in both the proximal and distal third of the operated leg at Time 3, which explains the larger percentage change in [Table 5]. The patient who received Botox showed a decrease in muscle mass and an increase in fatty infiltration in the distal third of the operated leg. The two patients in the placebo group showed an increase in muscle mass and a decrease in fatty infiltration [Table 5]. The main objective of this study was to evaluate the radiological and clinical effects of lower limb lengthening on muscle and to explore the effect of Botox in muscles in children undergoing lengthening of the femur or tibia. Overall, our clinical findings show that muscle strength recuperates at an average follow-up of 25.3 months (SD = 1.4 months). Furthermore, adolescents report their levels of physical function and sports to be higher at Time 3 as compared to Time 1 and 2. With regards to radiological findings, although a decrease in muscle size (TCSA) and muscle mass (FCSA) was observed at Time 2 in the operated thigh of patients undergoing femur lengthening, muscle mass was regained at Time 3. However, TCSA and FCSA remained lower in the operated femur compared to the nonoperated femur at Time 3. 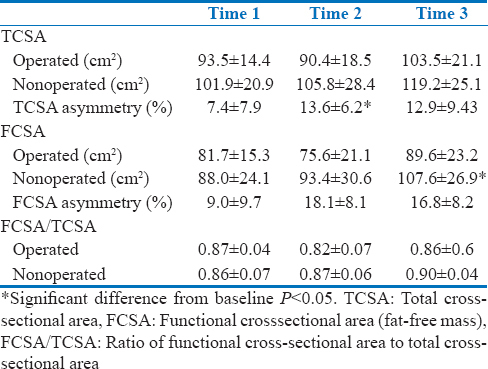 A lower ratio of FCSA/TCSA at Time 3 was also observed in the operated femur, suggesting a slightly higher percentage of fatty infiltration, which was not evident at baseline. Similar changes were also observed in patients who underwent tibial lengthening; although TCSA and FCSA increased in the proximal and distal third of both legs at Time 3, the ratio of FCSA/TCSA remained lower in the operated tibia. These variations in muscle mass and composition were not reflected in our clinical assessment, as the quadriceps and tibialis anterior muscle strength remained constant in both legs across the three time points. Although one must keep in mind that MMT is evaluator-dependent and remains a subjective measure of muscle strength. Conversely, these findings are in accordance with our initial hypothesis and suggest that the lengthening procedure caused radiological changes suggesting a degree of disuse of the affected extremity and compensatory mechanisms/overuse of the contralateral leg. Despite such changes, participants showed an overall increase in muscle mass and muscle size of the thigh and leg musculature overtime, as expected in adolescents. When comparing radiological findings according to the treatment group (Botox vs. placebo), the patient who received a Botox injection had a slight increase in muscle size (3.6%) but a decrease in FCSA (−2.5%) and FCSA/CSA (−0.05) in the operated thigh at Time 3 following femur lengthening, suggesting an increase in fatty infiltration as compared to baseline. A decrease in TCSA and FCSA was also observed in the nonoperated femur of this participant. This decrease in muscle size and mass in both the operated and nonoperated femur may have affected his overall gait pattern and possibly limited his participation in physical activity. Indeed, the markedly reduced physical activity overall during the lengthening process may contribute to the radiological changes in both femurs. However, these radiological changes do not seem to affect clinical performance at Time 3. Similarly, a slight decrease in muscle FCSA/CSA at Time 3 was also observed in the proximal and distal third of the operated side in the patient who underwent tibial lengthening and received a Botox injection. Such changes were not observed in the 3 patients included in the placebo group, which showed an increase in TCSA, FCSA, and FCSA/CSA at Time 3, even though all muscle parameters remained lower in the operated leg. These findings suggest that Botox treatment appeared to slow muscle gain and increased fatty infiltration over time, yet muscle mass and fatty infiltration normalized at Time 3 in both femoral and tibial lengthening. A previous MRI study reported long-term alterations (e.g., decrease in muscle CSA and increase in fatty infiltration) of the gastrocnemius muscle following Botox injection in two adult male. A significant decrease in muscle mass and increase in fatty infiltration has also been reported in 12 adults (mean age 45.5 years) treated with Botox injections for piriformis syndrome. While previous animal model studies reported a decrease in muscle mass and increased intramuscular fatty infiltration following Botox injection,, with a concomitant decrease in muscle strength. Moreover, functional weakness in noninjected adjacent muscles has also been reported, suggesting that Botox can pass through the muscle fascia and affect the mechanical properties of neighboring muscles., A RCT with 125 children undergoing lower limb lengthening and deformity correction found that clinical parameters including muscle strength, ambulation, and quality of life were decreased during the lengthening process, but returned to baseline levels at 3-months postframe removal. This longitudinal pattern was evident as well in our clinical findings regarding muscle strength and physical function., Although the findings of the study by Hamdy et al. demonstrate the safety and potential benefit of Botox, there was a need to extend the follow-up period to document the long-term effects of Botox on the muscle. An important contribution of the current study is the use of advanced radiological testing to evaluate the effect of the lengthening procedure and the effect of Botox on the muscles at 24 months postsurgery. Botox is frequently used as a therapeutic modality to induce relaxation of spastic muscles by preventing the release of acetylcholine from presynaptic motor nerve terminals. However, the long-term effect and pathogenesis of Botox regarding the induced-muscle weakness and skeletal muscle mechanical properties deserve further attention. Additional studies with larger sample size and detailed time-dependent muscle changes are needed to explore the state of muscle composition after surgical and pharmacological interventions. Limitations include variability among patients in the location of the slices used; therefore, limiting the number of slices available for analysis. Challenges with recruitment resulted in adding a preference-based design to the randomization methodology. The two patients who received Botox were prepubertal compared to the subjects in the placebo group, introducing the potential confounding effect of hormones on muscle and differences relating to growth velocity. Although the small sample size, this is the first study to quantify the effect of a lower limb lengthening on muscle morphology using MRI. Despite the small sample size, the findings of this pilot study are novel and provide complementary information on the radiological effects on muscle following DO. Our results suggest a decrease in muscle mass and an increase in fatty infiltration at 12-month postsurgery. At the last follow-up, MRI quantification denoted an increase in muscle mass and decrease in fatty infiltration denoting better muscle quality. Yet, the muscle quality remained inferior to that of the nonoperated side at the latest follow-up. On the other hand, physical activity returned to baseline levels, which may suggest that the morphological changes observed through MRI had little impact on function. To gain a better understanding of the effect of lengthening and Botox injection treatment on muscle function, future studies should use objective measures of muscle strength, such as Biodex, a larger sample and longer follow-up period. We wish to thank Dr. Michel Azouz, radiologist at Shriners Hospitals for Children, Canada, for his contribution, Johanne l'Écuyer, head of radiology at the McGill University Health Center for her help in coordinating MRIs, and François Champion, Medical Imaging Manager at Shriners Hospital for Children, Canada, for retrieving the images. Much appreciation to the patients and their families for their participation in this study. Funding to conduct this study was obtained by the Pediatric Orthopedic Society of North America (POSNA Research Award June 1, 2010). POSNA did not play a role in the investigation or in the interpretation of results. None of the authors received financial support from either pharmaceutical or industry backing. Paley D. Current techniques of limb lengthening. J Pediatr Orthop 1988;8:73-92. De Bastiani G, Aldegheri R, Renzi-Brivio L, Trivella G. Limb lengthening by callus distraction (callotasis). J Pediatr Orthop 1987;7:129-34. García-Cimbrelo E, Olsen B, Ruiz-Yagüe M, Fernandez-Baíllo N, Munuera-Martínez L. Ilizarov technique. Results and difficulties. Clin Orthop Relat Res 1992;283:116-23. Maffulli N, Lombari C, Matarazzo L, Nele U, Pagnotta G, Fixsen JA, et al. Areview of 240 patients undergoing distraction osteogenesis for congenital post-traumatic or postinfective lower limb length discrepancy. J Am Coll Surg 1996;182:394-402. Noonan KJ, Leyes M, Forriol F, Cañadell J. Distraction osteogenesis of the lower extremity with use of monolateral external fixation. A study of two hundred and sixty-one femora and tibiae. J Bone Joint Surg Am 1998;80:793-806. Eldridge JC, Bell DF. Problems with substantial limb lengthening. Orthop Clin North Am 1991;22:625-31. Paley D. Problems, obstacles, and complications of limb lengthening by the ilizarov technique. Clin Orthop Relat Res 1990;250:81-104. Young N, Bell DF, Anthony A. Pediatric pain patterns during ilizarov treatment of limb length discrepancy and angular deformity. J Pediatr Orthop 1994;14:352-7. Dahan-Oliel N, Kasaai B, Montpetit K, Hamdy R. Effectiveness and safety of botulinum toxin type a in children with musculoskeletal conditions: What is the current state of evidence? Int J Pediatr 2012;2012:898924. Zorowitz RD, Leffler JB, Murray CF, Robinson R. Spasticity: A clinical review. Medscape; 2008. Available from: http://www.journal.medscape.com/viewarticle/576698_4. [Last accessed on 2016 Mar]. Hamdy RC, Montpetit K, Raney EM, Aiona MD, Fillman RR, MacKenzie W, et al. Botulinum toxin type A injection in alleviating postoperative pain and improving quality of life in lower extremity limb lengthening and deformity correction: A pilot study. J Pediatr Orthop 2009;29:427-34. Olabisi R, Best TM, Vanderby R Jr., Petr S, Noonan KJ. Effects of botulinum toxin A on functional outcome during distraction osteogenesis. J Orthop Res 2007;25:656-64. Roger Aoki K. Botulinum neurotoxin serotypes A and B preparations have different safety margins in preclinical models of muscle weakening efficacy and systemic safety. Toxicon 2002;40:923-8. Longino D, Butterfield TA, Herzog W. Frequency and length-dependent effects of botulinum toxin-induced muscle weakness. J Biomech 2005;38:609-13. Hamdy RC, Montpetit K, Aiona MD, MacKenzie WG, van Bosse HJ, Narayanan U, et al. Safety and efficacy of botulinum toxin A in children undergoing lower limb lengthening and deformity correction: Results of a double-blind, multicenter, randomized controlled trial. J Pediatr Orthop 2016;36:48-55. Lee DH, Ryu KJ, Shin DE, Kim HW. Botulinum toxin a does not decrease calf pain or improve ROM during limb lengthening: A randomized trial. Clin Orthop Relat Res 2014;472:3835-41. Hamdy RC, Montpetit K, Ruck-Gibis J, Thorstad K, Raney E, Aiona M, et al. Safety and efficacy of botox injection in alleviating post-operative pain and improving quality of life in lower extremity limb lengthening and deformity correction. Trials 2007;8:27. American Academy of Orthopaedic Surgeons. Outcomes Instruments and Information. PODCI (Pediatric/Adolescent) Instruments; 25 May, 2009. Available from: http://www.aaos.org/research/outcomes/outcomes_peds.asp. [Last accessed 2016 Apr]. Daltroy LH, Liang MH, Fossel AH, Goldberg MJ. The POSNA pediatric musculoskeletal functional health questionnaire: Report on reliability, validity, and sensitivity to change. Pediatric Outcomes Instrument Development Group. Pediatric Orthopaedic Society of North America. J Pediatr Orthop 1998;18:561-71. Fortin M, Battié MC. Quantitative paraspinal muscle measurements: Inter-software reliability and agreement using OsiriX and ImageJ. Phys Ther 2012;92:853-64. Schroeder AS, Ertl-Wagner B, Britsch S, Schröder JM, Nikolin S, Weis J, et al. Muscle biopsy substantiates long-term MRI alterations one year after a single dose of botulinum toxin injected into the lateral gastrocnemius muscle of healthy volunteers. Mov Disord 2009;24:1494-503. Al-Al-Shaikh M, Michel F, Parratte B, Kastler B, Vidal C, Aubry S, et al. An MRI evaluation of changes in piriformis muscle morphology induced by botulinum toxin injections in the treatment of piriformis syndrome. Diagn Interv Imaging 2015;96:37-43. Gilotra M, Nguyen T, Christian M, Davis D, Henn RF 3rd, Hasan SA, et al. Botulinum toxin is detrimental to repair of a chronic rotator cuff tear in a rabbit model. J Orthop Res 2015;33:1152-7. Fortuna R, Vaz MA, Youssef AR, Longino D, Herzog W. Changes in contractile properties of muscles receiving repeat injections of botulinum toxin (Botox). J Biomech 2011;44:39-44. Yaraskavitch M, Leonard T, Herzog W. Botox produces functional weakness in non-injected muscles adjacent to the target muscle. J Biomech 2008;41:897-902. Fortuna R, Horisberger M, Vaz MA, Herzog W. Do skeletal muscle properties recover following repeat onabotulinum toxin A injections? J Biomech 2013;46:2426-33. Montpetit K, Hamdy RC, Dahan-Oliel N, Zhang X, Narayanan UG. Measurement of health-related quality of life in children undergoing external fixator treatment for lower limb deformities. J Pediatr Orthop 2009;29:920-6.